Doctors in several states are reporting an increase in Hand, Foot, and Mouth Disease, which normally affects children under age 5, but adults can get it, too. There's a simple way to protect yourself. An apparent increase in cases of the often painful Hand, Foot, and Mouth Disease is causing doctors to warn parents about the importance of proper hygiene. Although it's most common among young children, even one Major League Baseball player has been sidelined with it. Doctors in several states are reporting increased cases of Hand, Foot, and Mouth Disease (HFMD) including Indiana, South Carolina, Tennessee, and Virginia. 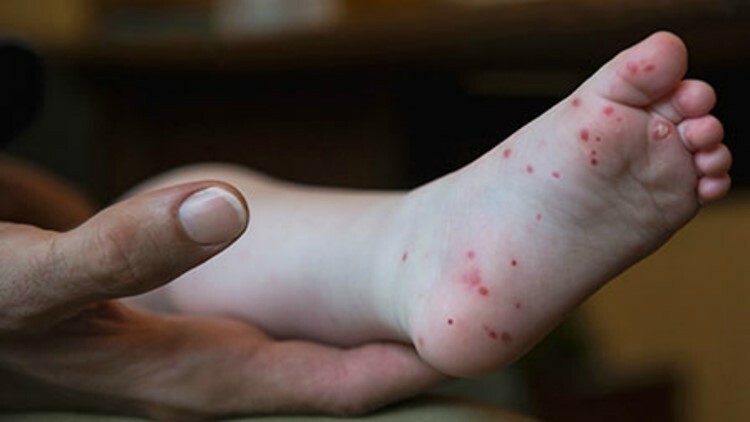 "This year we're getting a lot of hand, foot and mouth disease (cases)," said Keith Tolar, Medical Director of Deaconess Pediatric Urgent Care in Evansville, Indiana. "We've been seeing it all summer and a little bit of an uptick in the last week or two." New York Mets pitcher Noah Syndergaard was placed on the 10-day disabled list last week after contracting HFMD. The CDC's website said HFMD "is a contagious illness caused by different viruses. It is common in infants and children younger than 5 years old, because they do not yet have immunity to the viruses that cause HFMD. However, older children and adults can also get HFMD." The CDC said symptoms can start with a fever, reduced appetite, sore throat, and a general feeling of being sick. After a couple of days, painful sores can develop in the mouth -- usually starting as small red spots that can turn into painful blisters. A skin rash on the palms of the hands and soles of the feet can also develop in a couple of days, and turn into blisters. They can also appear on other parts of the body. If the infected person gets dehydrated or is not able to swallow enough liquids because of the mouth sores, the CDC said they should see a doctor. Viruses that can cause HFMD can be found in an infected person's nose and throat secretions, the fluid in their blisters, or their feces. The CDC said good hygiene and washing hands are crucial to prevent the spread of the disease. While it is not considered serious, and nearly all people recover in 7 to 10 days, the CDC said there are rare cases in an infected person can develop viral meningitis. Even rarer -- patients cold develop polio-like paralysis, or encephalitis, which can be fatal.